Check out these beauty products that are donating a portion of their proceeds to help fight breast cancer. The four new Aromessence Aromatherapy Gift Sets from DECLÉOR includes a full size AromessenceTM serum, travel and sample sizes of the adapted daytime moisturizer, and products for body. 10% of the proceeds will go to the CEW foundation Cancer and Careers. Dermstore.com will donate 5% to the foundation as well. $68-$84. 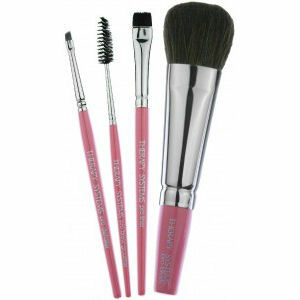 Therapy Systems is donating 20% of net proceeds from their Pink Pro Brush line in October to the Tennessee Breast Cancer Coalition. TherapySystems.com, Prices vary depending on brush. Apply Scartini twice a day to help heal scrapes, cuts, surgical incisions, burns, stretch marks, acne scars, sun damage and wrinkles. 20% of each sale in October will be donated to BreastCancer.org. Scartini.com, $29.99. Sanítas Skincare has produced a limited edition pink labeled PeptiDerm Eye Treatment to help prevent the signs of premature aging in honor of breast cancer awareness. A portion of the proceeds will benefit Sense of Security, a Denver charity that helps breast cancer patients with financial hardships. GetSanitas.com, $68. 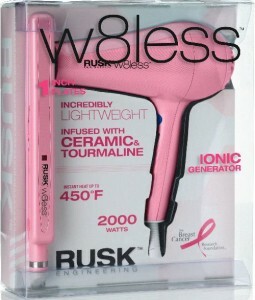 RUSK will donate $40,000 from the sales of their special limited pink W8less products to The Breast Cancer Research Foundation. Available at professional salons nationwide, ULTA & Stylesource.com, $199.90. Apply the Red Carpet Primer from emerginC before your foundation to reduce the appearance of fine lines and wrinkles. It also keeps the skin hydrated and protected with Vitamin C. 20% of sales during October will be donated to Living Beyond Breast Cancer. SkinStore.com, $142. 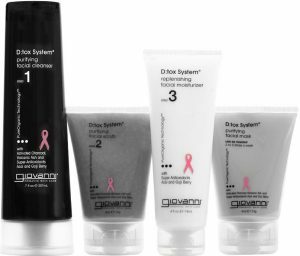 The new D:tox System Facial Care line from Giovanni is a three-step daily program that cleans and detoxifies skin with ingredients like Volcanic Ash, Charcoal, Goji and Acai. The packaging features the breast cancer ribbon because 5% of the proceeds is donated to the cause all year long. Prices available upon request.